Treasury Department lawyers consulted with the White House general counsel’s office about the potential release of President Trump’s tax returns before House Democrats formally requested the records, Treasury Secretary Steven Mnuchin said Tuesday. Mnuchin had not previously revealed that the White House was playing any official role in the Treasury Department’s decision on releasing Trump’s tax returns. Democrats are asking for six years of Trump’s returns, using a federal law that says the treasury secretary “shall furnish” the records upon the request of House or Senate chairmen. The process is designed to be walled off from White House interference, in part because of corruption that took place during the Teapot Dome scandal in the 1920s. Congress has no business investigating the president for conduct that occurred before he took office. 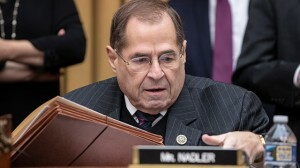 As William Barr begins his term as attorney general, House Democrats are aiming a “subpoena cannon” at President Trump, hoping to disable his presidency with investigations and possibly gather evidence to impeach him. Mr. Trump fired back in his State of the Union address: “If there is going to be peace and legislation, there cannot be war and investigation.” To protect the presidency and separation of powers, Mr. Barr should be prepared to seek a stay of all congressional investigations of Mr. Trump’s prepresidential conduct. The president is not one among many, as are legislators and judges. Crippling his ability to function upsets the constitutional balance of power. For this reason, the Justice Department’s Office of Legal Counsel has repeatedly concluded that a sitting president may not be indicted or prosecuted. The same logic should apply to congressional investigations. Congress is targeting Mr. Trump’s actions before becoming president because there are well-established constitutional limits, grounded in separation-of-powers doctrine, on its ability to investigate his official conduct. In U.S. v. Nixon (1974), the Supreme Court recognized a constitutionally based, although not unlimited, privilege of confidentiality to ensure “effective discharge of a President’s powers.” In Nixon v. Fitzgerald (1982), the justices held that presidents and ex-presidents have absolute immunity against civil liability for official presidential acts.